Sing to me of the man, Muse, the man of twists and turns driven time and again off course, once he had plundered the hallowed heights of Troy. Many cities of men he saw and learned their minds, many pains he suffered, heartsick on the open sea, fighting to save his life and bring his comrades home. But he could not save them from disaster, hard as he strove – the recklessness of their own ways destroyed them all, the blind fools, they devoured the cattle of the Sun and the Sungod blotted out he day of their return. Launch out on his story, Muse, daughter of Zeus, start from where you will – sign for our time too. These are the words spoken at the commencement of The Odyssey. Here, the poet asks of the Muse for inspiration. The Odyssey proclaims it subject matter to be different from Iliad. 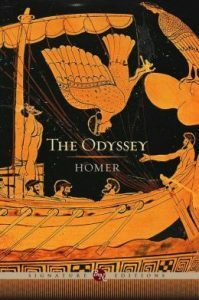 Where Homer’s first epic focuses on Achilles’ rage, the Odyssey follows a ‘man of twists and turns.’ It doesn’t follow battles, instead it follows the long journey through many cities and much pain. The opening paragraph offers foreshadowing into how the poem will end – Odysseus having survived, but all of his men having perished. It also offers a reason for their deaths – the recklessness of the men and their own inability to see that by slaughtering the Sun’s cattle that they are effectively sealing their fate. This is Calypso’s final plea to Odysseus. She begs for him to stay with her, and spares nothing trying to tempt him. She promises to save him from future woes, and to give him immortality. Odysseus turns down her offer, yearning to be reunited with his wife, despite his own admittance that Penelope’s beauty does not rival that of Calypso. It is obvious that Odysseus yearns to see his wife again, but he is also intrigued by what Calypso has offered to him. She asks him one final time if he wants to leave, mentioning that she knows how tempting her offer is, but that Odysseus has the option to refuse. so grieve no more dying, great Achilles. This is the conversation has between Odysseus and Achilles when Odysseus journeys to the underworld. This entire occurrence is told as a flashback by Odysseus to the Phaeacians. The heroes lament on the differences between the two worlds, each affirming that the grass is greener on the other side. Odysseus is envious of Achilles’ strength, and Achille of Odysseus for still being alive. he thinks he will never suffer affliction down the years. These are the words spoken by Odysseus to Amphinomus not long after the defeat of the Beggar-King Irus. Being disguised as a beggar himself, these words help Odysseus to stay in character. As his story depicts, he was once a steadfast warrior, seizing lands, until his capture. To a certain degree, his statement here helps to reinforce that lie. The fatalism and feebleness he expresses – proclaiming that a man only succeeds while the ‘gods grant him power’ – are indicative of ancient Greek outlook, and appear all to natural coming from a onetime king who is now a beggar. the Son of Pain, a name he’ll earn in full. This passage is used to explain how Odysseus’s name came to be. The passage itself is spoken by his grandfather, Autolycus, he had named Odysseus when he was an infant. His name suggest that pain is, in some form, rooted into his DNA.